Dr Lynley Anne Herbert, Robert and Nancy Hall Assistant Curator of Rare Books and Manuscripts at Walters Art Museum, investigates a mysterious image and accompanying rebus found within the pages of a liber amicorum or “friendship book”, an album for recording friendships and social connections that amounted to a kind of seventeenth-century version of Facebook. In the spring of 2012, the Walters Art Museum in Baltimore purchased a charming illuminated liber amicorum, or friendship book, that had never before been known to scholars and on which research has just begun (Fig. 1). Started by Joannes Carolus Erlenwein when he entered the Jesuit seminary school at Fulda in 1614, the book contains 13 watercolor images and 55 painted heraldic devices, all accompanied by personal dedications from friends and family. Paintings of his home, of him hunting and rescuing damsels in distress, and of playing games with friends provide an intimate view of his world. 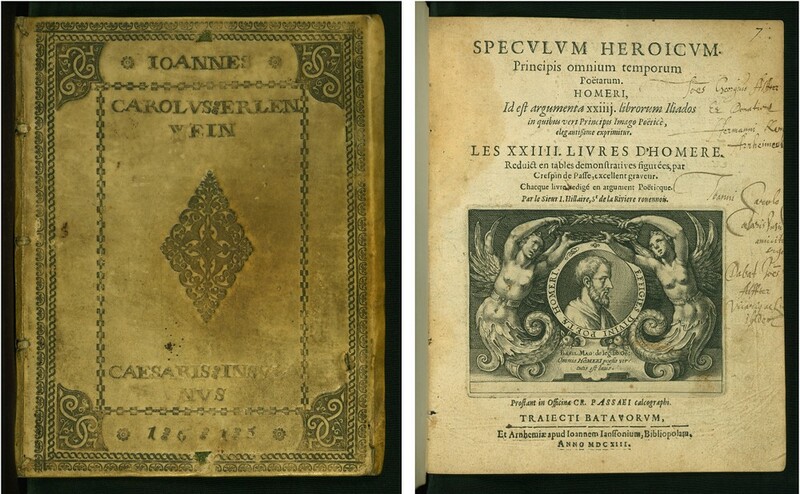 In constructing his book, Joannes chose to interleave blank pages with a newly published emblem book based on Homer’s Iliad, the first (and only) edition of Isaac Hillaire’s Speculum Heroicum (Fig. 2). The images were engraved by Crispin de Passe the Elder, who had come to realize that some of his books were being converted into liber amicorums, and began producing engravings with blank versos to provide room for inscriptions. As this book fits that pattern, it is likely that the Speculum Heroicum was designed with this purpose in mind. A partially trimmed inscription on the cover page indicates the book was gifted to Joannes at some point between its publication in 1613 and the binding of his amicorum in 1615, so it is possible that the gift of the emblem book inspired him to begin his friendship album. Left – Fig. 1: Original Binding of the Liber Amicorum of Joannes Carolus Erlenwein, dated 1615. Walters Art Museum, Baltimore, W.922 – Source. Right – Fig. 2: Title page of Isaac Hillaire’s Speculum Heroicum. Crispin de Passe the Elder, 1613. Walters Art Museum, Baltimore, W.922, p. 7 – Source. Books of this kind grew out of university culture in Germany in the sixteenth century, but by the seventeenth century had become a form of social networking used by people of all professions and stages in life – the seventeenth-century Facebook. Often these books were kept up over decades, with their owners eagerly gathering inscriptions of those they met throughout their travels, and seeking autographs of the notables of their day. Through these inscriptions, they built relationships, documented their worldliness, and created an image of who they were through the people they had gathered. Despite its creation in this later period, the entries in Joannes’ book rarely extend beyond his school days, and therefore provide a snapshot of youthful joy and playfulness, full of anticipation of life to come as he and his friends prepared for manhood. The school they attended, the seminary at Fulda, was modeled on the uniquely German Knight’s Academies – finishing schools designed to train the sons of the elite to become the next generation of courtiers. The curriculum concentrated on activities that helped develop courtly and knightly skills, such as fencing, dancing, painting, shooting, horseback riding, and ball playing. Several of these activities have been depicted in the book’s strikingly personal and informal images. 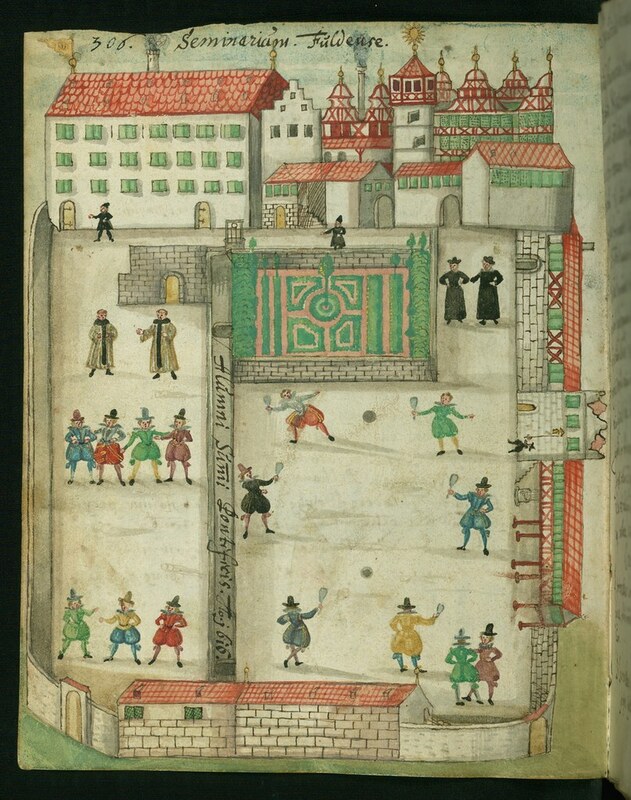 The most unusual and charming of these is the tennis game (Fig. 3), which the students seem to have chosen as their “group portrait.” After exploring the meticulous work by Heiner Gillmeister on the subject, the Walters’ image appears to be unique in that it depicts the students playing outside in the cloister instructed by the clergy, rather than playing in the famous enclosed, paved ball court at Tübingen as all other known amicorum images do. Tennis was in fact a surprisingly popular topic in proverbs, mottos, and poetry in the seventeenth century, and Joannes’ book might have resonated on many of these levels. It is an image of playfulness, of healthy competition, and teamwork – an eternal moment of fraternity frozen in time. Fig. 3: Tennis game. Anonymous, 1616. Walters Art Museum, Baltimore, W.922, p. 306 – Source. Although the book’s images focus on his time at school, there is one intriguing exception. Nearly three decades after he began his amicorum, Joannes allowed a new friend to add a playful painting. In 1642, Johannes Blittersdorff provided a straight-forward inscription with an image that is anything but (Fig. 4). Fig. 4: Painting and inscription contributed by Johannes Blittersdorff. 1642. Walters Art Museum, Baltimore, W.922, p. 303 – Source. The painting is surmounted by a rebus, a riddle of words and images, which contains three pictorial symbols (Fig. 5, detail). Fig. 5: Detail of rebus from Fig. 4 – Source. The first one, a heart, is a common element in rebuses of the period, and simply stands for “heart”. The last symbol is a globus cruciger, which in Christian iconography usually indicates Christ’s dominion over the earth, but in contemporary rebuses is interpreted more generally as the “world”. The middle symbol is crucial for interpretation, yet is the least comprehensible. At first glance, it appears key-like, allowing for a romantic phrase that reads “The hearts of women are the key to the world”. However, further contemplation of the symbol complicates this interpretation, for its resemblance to a key is vague at best, suggesting it is either poorly painted or meant to represent something else entirely. It actually most closely resembles a jaw harp, a small instrument played with the mouth that produces a distinctive twanging sound (Fig. 6). The possibility that this is the intended meaning of the symbol at first seems untenable, as it does not appear to fit the phrase in any logical way. Inserting the common French term for the instrument, guimbarde, gives us nothing, as does the German term maultrommel. However, discovering earlier French names for it, jeu-trompe and trompe de Béarn, suddenly supplies the image with a double entendre. If the word “trompe” is inserted in the phrase, an unexpectedly negative phrase emerges: “Le coeur de dames trompe le monde”, or “The hearts of women deceive the world”. There is little doubt that this is the correct interpretation, as it is a known proverb. The phrase in fact appeared on the Queen of Hearts in a playing card ca. 1500 (Fig. 7). Yet while this mystery is solved, the question of how it relates to, and informs the image above, is just as cryptic. Left – Fig. 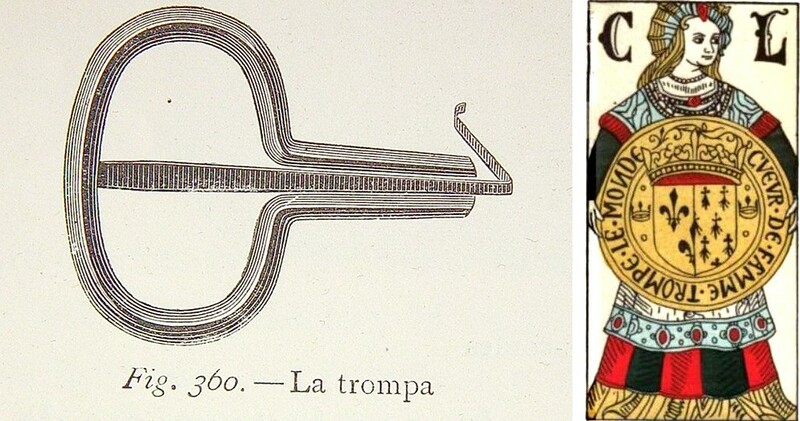 6: Jaw harp, etching, from El mundo físico : gravedad, gravitación, luz, calor, electricidad, magnetismo, etc. / A. Guillemin, Barcelona Montaner y Simón, 1882 – Source. Right – Fig. 7: French playing card with Queen of Hearts holding inscription found in rebus. Anonymous, c. 1500. Originally from Leo S. Olschki, La Bibliofilia, Firenze, Giuseppe Boffito, 1906. – Source. The painting is titled the “Arbor Saxonica”, usually a reference to the royal family tree of the Saxons going back to the early medieval period, so calling this image by such a pretentious, regal title is surely tongue in cheek. Here we are presented with a literal tree with four women perched on different branches. 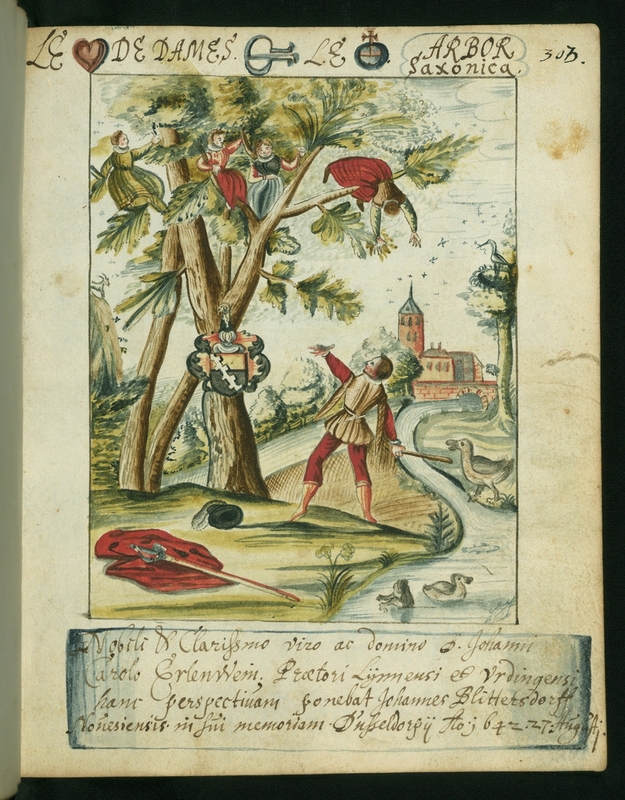 The heraldry of the signer Johannes Blittersdorff is attached to the trunk, suggesting he is the man standing below. He has removed his hat, cloak, and sword, and holds a stick in one hand, and perhaps a feather or leaf in the outstretched one. The woman on the right precariously balances on a limb and comically flails as she begins to fall, while the man below strikes a seemingly heroic pose, yet makes no chivalrous move to catch her. The heraldry attached to the tree, along with the “Arbor Saxonica” inscription, suggest perhaps the image is meant as a commentary on Blittersdorff’s family tree. However, taken with the rebus above, another line of interpretation becomes possible. Perhaps the phrase appearing on a playing card – a Queen of Hearts – is a clue to the image. Playing cards of this period varied greatly in themes and imagery, but many German cards depict a vine or tree from which various items sprout. 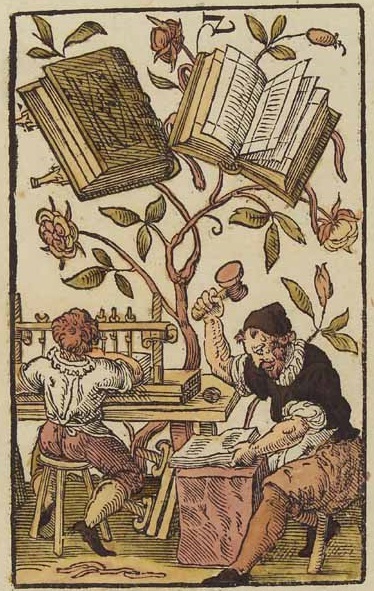 In a famous example, Jost Amman created a series in which the usual German suits – bells, acorns, hearts, and leaves – have been substituted for objects related to his printing profession (Fig. 8). Two of Books. Jost Amman, Charta Lusoria, 1588. – Source. Trees shoot up behind the charming vignettes below, carrying objects such as books and inkpots in their branches. The type and number of objects in the tree reveals the suit and number of the card. Perhaps in the liber amicorum, the women in the tree serve a similar function. The rebus refers to the “hearts” of women, and the skirt of the falling woman, as well as the man’s cloak, echo the reference through their heart-like shapes. Is this the “4 of hearts?” Could the image be a reference to, or joke about, a card game shared between Joannes and his friend? Or perhaps do we read the women, with their deceptive hearts, as the ones playing games of love with the man? The image is strange, and funny, and defies easy interpretation. It has the feel of a visual pun, an inside joke between friends that has been lost to time. Thus is the challenge, and the charm, that comes with visual games that are both highly personal and four centuries old. But perhaps someone out there holds the key to the image’s secrets…is it you? Thoughts or feedback? Please contact Lynley Herbert at lherbert@thewalters.org. Dr Lynley Anne Herbert is the Robert and Nancy Hall Assistant Curator of Rare Books and Manuscripts at the Walters Art Museum in Baltimore. She received her doctorate in May, 2012, from the University of Delaware, and while the subject of her dissertation was a Carolingian manuscript, her research interests also include later manuscripts and early printed books. The above discussion of the Walters’ liber amicorum is part of a larger article soon to be published in the Journal of the Walters Art Museum. The Walters Art Museum is in the process of digitizing its nearly 1,000 manuscripts, thanks to three generous grants from the National Endowment for the Humanities. Digitized cover to cover, these books can be found at http://www.thedigitalwalters.org, and the images can be used freely under a Creative Commons Attribution-ShareAlike 3.0 Unported license. To explore the Liber Amicorum discussed above, go to http://www.thedigitalwalters.org/Data/WaltersManuscripts/html/W922/. This post is part of our Curator’s Choice series, a monthly feature consisting of a guest article from a curator about a work or group of works in one of their “open” digital collections. The series is undertaken in partnership with OpenGLAM and made possible through funding from the European Union’s DM2E project.